How do you move forward from a night that changes everything if you can’t even remember it? With high school finally over, and her long-awaited South American adventure just around the corner, Savannah expects to wind up in the arms of her first real love Chase at the end of tonight’s party. Instead, she wakes up on the bathroom floor. She knows she wasn’t alone – except that she can’t remember any of it. Chase is nowhere to be found. And the only one picking up the pieces is her outrageous and unpredictable best friend, Pete. Amidst the devastating emotional wreckage of sexual assault, Savannah struggles to fit together the jigsaw puzzle of before and after, while shielding the truth from everyone around her. Will the worst night of her life keep Savannah from her dreams of first love and finding the road less travelled? 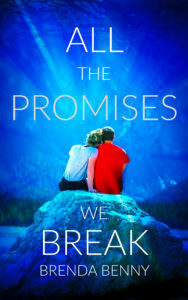 All The Promises We Break is the first of a two book series that follows Savannah through a tragic 1990’s night that tears her apart from her first young love, only to set in motion a chain of events that will lead them back to one another years later, in the sequel How To Tell, to reveal if the healing process can truly offer a second chance at first love.